The Everglades 360LXC makes her debut as Everglades’ official luxury cruising model. 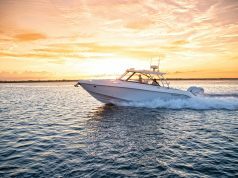 While the 360LXC (37’8″ LOA, 10’8″ beam) is more passenger focused than the Edgewater, Florida-based builder’s other models, the features customers enjoy from the brand are evident at first glance—the signature Everglades silhouette and the superior ride of its RAMCAP hull. Everglades honed in on extravagance and relaxation for this 36-foot overnighter while maintaining its signature fit and finish. Guests can relax in the spacious 100-square-foot lounging area, which features an L-shaped lounge that serves as a dining area or sunbed. The Everglades 360LXC comes standard with a 32-inch retractable flat-screen TV in the lounge area, an electric stovetop and outdoor cockpit cooking area. 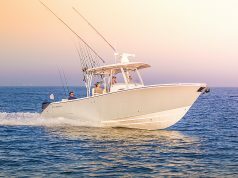 The boat also offers abundant cooler storage (three refrigerators and an icemaker) and a fully equipped wet bar and mixing station. 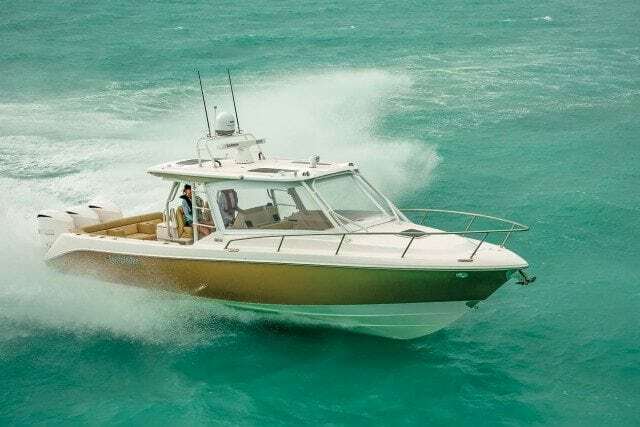 Its massive aft bench seat comfortably seats five people, while the redesigned helm features ergonomic captain and companion seating with room for three. 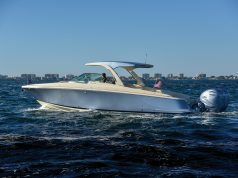 The boat sleeps five to six passengers, and both the cabin and the cockpit lounge area are independently temperature controlled to keep you comfortable in any weather conditions. When powered by triple 350-hp outboard engines, the 360LXC runs to a top speed of 58 mph.